Just to give a little background about myself. I was born and raised in Cambridge, Massachusetts. I studied at Framingham State University and received my Bachelor’s Degree in fashion design and merchandising in 2007. After about a year I knew I wanted to go back to school to further my education and receive my Master’s Degree in business. While in graduate school I started to feel weird symptoms within my body. I was repeatedly falling, could not raise my right arm and other things that were not normal to me. I thought to myself "Maybe I just need to lose weight and get my body in order and these things will go away". I went to see a neurologist at Mount Auburn Hospital in Cambridge. She recommended a series of tests, EKG, Muscle Biopsy, EMG and an MRI. The results explained what was going on with me, I have Limb Girdle Muscular Dystrophy. For those who may not know, Muscular Dystrophy (MD) is a group of muscle diseases that result in increased weakening and breakdown of skeletal muscles over time. The most common type is Duchenne Muscular Dystrophy (DMD) which typically affects males beginning around the age of four. I have Limb-Girdle Muscular Dystrophy (LGMD) which affects both boys and girls. LGMD shows a similar distribution of muscle weakness, affecting both upper arms and legs. Many forms of LGMD have been identified showing different patterns of inheritance (autosomal recessive vs. autosomal dominant). LGMD which has many subtype variants, such as 2A, 2B, 2J and many others, which to this day still amazes me. Unfortunately, I still don’t know my subtype, although I have done numerous genetic testing with blood work and saliva on more than one occasion. My results have all come back inconclusive. When I took my first genetic test through the Jain Foundation, I kind of expected it was still going to come back as unknown. It was not a huge shock for me when it did. A few years later, my neurologist at MGH informed me of new developments in testing and suggested I take the test to see if anything had changed. I thought "Ok, let's do it.” It was even more exciting being told that the MDA was going to pay for it, with no cost to me, as these tests are quite expensive. I was happy because I knew I was going to get answers to my subtype for LGMD. Surprisingly, my results arrived pretty quickly by email. I opened it and rushed to read the part of how I was able to identify. And there it was “Unknown, Inconclusive”. I said to myself, “I am still unknown, this test did not give me any answers and I am still a mystery.” Although my test results said unknown, I needed confirmation. I called both my neurologists. I wanted them to confirm it for me because a part of me felt like I might be in denial or I might have been reading it wrong. Being the amazing doctors, they are, they responded within minutes and confirmed that my subtype is still unknown. They both asked me not to get discouraged, this is what makes me a unique individual and there are others out there like me who don’t know their subtype. They made me feel at ease and I thought to myself, “they are right, I am a unique individual, I will remain a mystery until further notice.” They also mentioned new testing will probably be developed within the next few years and we will try again. With all of that in my head, still not knowing my subtype and the only one in my family having Muscular Dystrophy, all I can think to myself is “Am I adopted?” "Was I switched at birth. ?” I always tease my family saying I always looked different, and that I was totally switched at birth and who are my real parents.? Because I am the only one in my family who has Muscular Dystrophy, I have a lot of questions that I feel need to be answered. I just received a new genetic testing kit, where I would be able to test myself, my parents and my sister to see if they possibly are carrying the gene for Muscular Dystrophy. This genetic testing would be a simple saliva test from each of us and I am hoping to possibly get some answers. I was told this test may come back with no one in my family carrying the gene at all. My doctor also mentioned this test will not tell me if they are my real parents or not. I said to myself, “aww man that is the main purpose for taking this test.” they totally laughed. I know although I may tease my family and give them a hard time about possibly being switched at birth, I know they are my parents and I love them dearly. They have been so supportive of me during this journey. I would eventually like to get answers to my subtype and other questions answered that are still questionable in my head. Muscular Dystrophy progresses as time goes on, over years. My MD has progressed over the years. I can totally see a difference in how my body feels and how now I am walking at a slower pace. I like the thought of being unique and a mysterious individual having this unknown subtype of Limb Girdle Muscular Dystrophy. I know that one day, I will get the answers I have been looking for, and even better, there will be a cure for this disease. I will be one of the happiest people alive once there is a cure, I will go running, jump on my bed and maybe walk up and down the stairs and back and forth across the floor, things I am unable to do now. Living with Muscular Dystrophy has its challenges that one can understand only if you are living with it. I have my ups and downs where I ask myself, “Why do I have this, where did this come from?.” Sometimes when I have an unexpected fall and end up on the floor, I ask myself, “Do I want to get up from the floor, should I hit my lifeline button?” With all of those questions, doubting myself and still trying to figure this Muscular Dystrophy life out, I know at the end of the day I will not allow it to stop me. I still manage to work part-time as a Merchandise Coordinator for Tommy John. 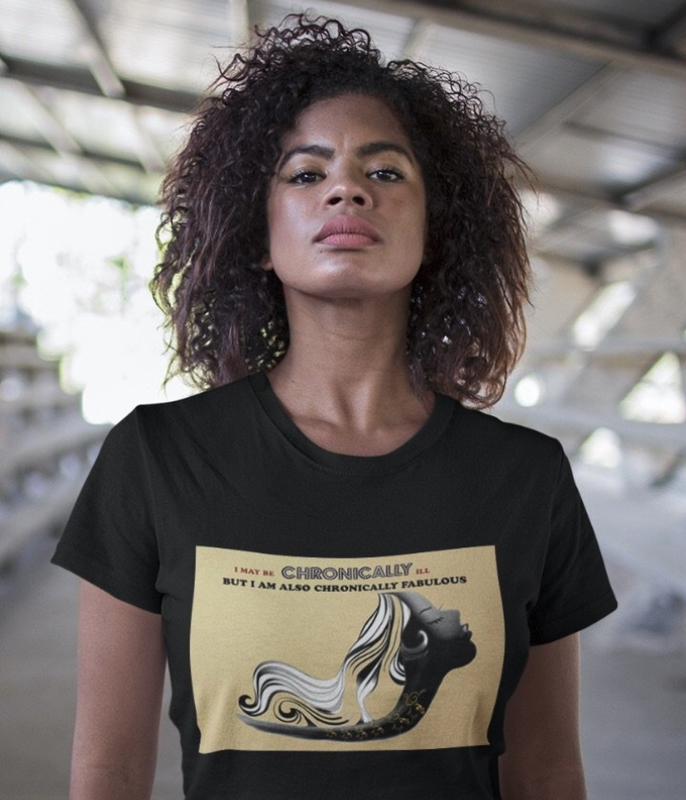 And most importantly I am continuing to work on my passion right now, running my own t-shirt line business called Girls Chronically Rock. This t-shirt line was inspired by me. I wanted to create a name with the word chronic in it. The first thing I thought of was Girls Chronically Rock. 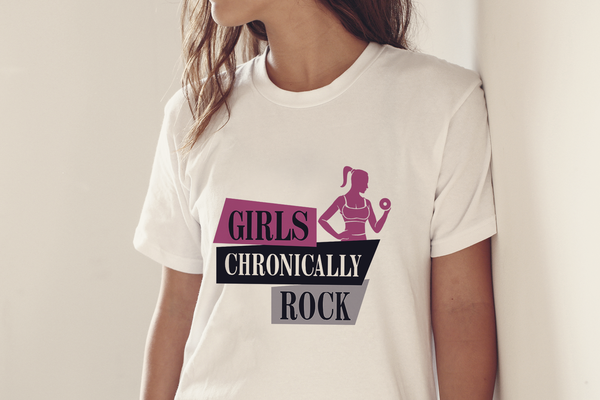 Although the name says Girls Chronically Rock, I wanted this line to be for both men and women with a line of t-shirts with different designs/and logos on them to help those who wear them feel inspired and motivated to embrace no matter what they may be dealing with at the moment. This t-shirt line means so much to me because it has a wonderful meaning behind it. I feel this brand will reach out to many others as an inspiration to keep up the fight. BIO – Keisha Greaves hopes to get her line in some department stores, gyms and fitness facilities, as well as expanding to other merchandise items including hats, headbands and more with the inspiration in each product for those with physical challenges. Check me out!